Dental braces (also known as braces, orthodontic cases, or cases) are devices used in orthodontics that align and straighten teeth and help position them with regard to a person’s bite, while also aiming to improve dental health. They are often used to correct underbites, as well as malocclusions, overbites, open bites, deep bites, cross bites, crooked teeth, and various other flaws of the teeth and jaw. 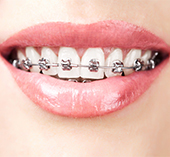 Braces can be either cosmetic or structural. Dental braces are often used in conjunction with other orthodontic appliances to help widen the palate or jaws and to otherwise assist in shaping the teeth and jaws. Do you live in or around Los Angeles? Call us to find out more info on our braces options.